IN three weeks’ time, thousands of devotees will gather in the dark in a field in Wiltshire. They do this every year and each time their number grows. They are there to celebrate the midsummer Solstice, the longest day of the year, and will wait until daybreak when the sun sends a piercing ray of light through Stonehenge, the ancient ruin they have come to venerate. This primordial circle of stones, eight miles north of Salisbury in Wiltshire, exerts an extraordinary power over the people of Britain. Some, like the Druids, claim it is the source of a mystical power while others, curious but sceptical, believe it to be the site of an ancient monument that has no relevance to the way we live today. Whatever their conviction they are all missing the point according to one man who has studied the location for 30 years and believes he knows the real reason why Stonehenge is so special. “Stonehenge is unique; it is already recognised as a World Heritage Site but it’s more than just an ancient curiosity, it is the place where civilisation began,” says writer and archaeologist Robert John Langdon. Robert fell under the spell of Stonehenge as a boy. He explored the massive stone monoliths and was intrigued by the official explanation of their origin. As the years passed and he learned more he was puzzled by contradictions in official explanation of its origins. If Robert is right, and he says he has the scientific evidence to prove he is, Stonehenge is the most important archaeological site in the world. It would mean Salisbury Plain is home to the first and most significant civilisation on earth. So how could this have happened? “The geography and landscape of the site would have been very different. Britain would have been emerging from the last Ice Age, so much of the country we now recognise would have been under water. Stonehenge would have been on an estuary that led to the open sea. Too many important facts have been ignored,” says Robert. “There is evidence that water was close, but that has been classified as a moat which I believe is wrong. It is also believed the stones were dragged over land from Wales which is misleading. 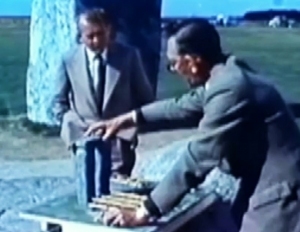 Robert’s hypothesis is based on his conviction that the men who built Stonehenge were much more skilled and sophisticated than is currently believed. In 10,000 BC, the Mesolithic period, he believes that men in ancient Britain developed the first recognisable civilisation and that Stonehenge was their greatest achievement. 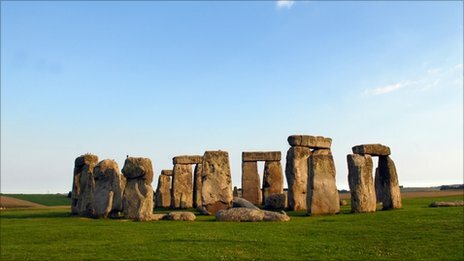 So why did these people make such an effort to build Stonehenge? what was it intended to do? “Stonehenge was accessible to boat people from all over Europe and Mesolithic men and women came there to be cured of their ailments and to depart from this world. The alignment of the site to the sun and the moon is immensely significant but so is the presence of the bluestones in the circle. “Bluestone turns blue in water, and was believed to have incredible powers of healing. Evidence from bones found close to Stonehenge suggests that the original inhabitants practised sophisticated medical procedures which included dentistry, limb removal and even brain surgery. If Robert Langdon is right Stonehenge is much older than the Pyramids and there is a surprising connection between the two ancient stone monuments. It is not only archaeologists with a theory about the significance of Stonehenge. The Druids regard it as a sacred place where they perform spiritual rituals. Robert says: “I don’t have any disputes with the Druids and they don’t seem to mind me. I’ll be rubbing shoulders with lots of them at the midsummer solstice. The Druids may well have their beliefs but they came on the Stonehenge scene very late in the day. “They would have discovered the site as an ancient and abandoned temple and taken it over but that’s all right. I get on pretty well with other archaeologists too although they do tend to dismiss my work, but that’s their loss. Stonehenge has a special hold on me and the more I learn about it the more fascinated I become. I’m already working on a new book which I think will ruffle quite a lot of feathers. A Stonehenge found in America. Is it bigger and better ? Probably….. While scanning underneath the waters of Lake Michigan for shipwrecks, archeologists found something a lot more interesting than they bargained for, as they discovered a boulder with a prehistoric carving of a mastodon, as well as a series of stones arranged in a Stonehenge-like manner. 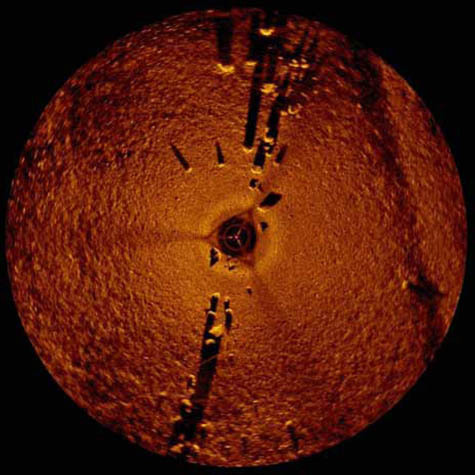 At a depth of about 40 feet into Lake Michigan’s Grand Traverse Bay, using sonar techniques to look for shipwrecks, archeologists discovered sunken boats and cars and even a Civil War-era pier, but among all these they found this prehistoric surprise, which a trained eye can guess by looking at the sonar scans photos in this article. Come and visit Stonehenge in England – you went get wet at this one! 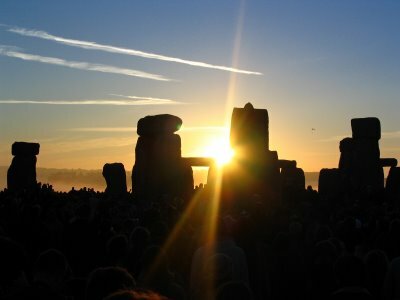 Stonehenge Winter Solstice 2012 – The end of the world is nigh, or is it ? I am surprised at the number of people asking questions and talking about the Stonehenge winter solstice next year. Many connections are being made to the Mayan calander and ‘the end of the world’ Will we see a record number of people turning up for ‘open access’ from around the world on the December 21st 2012 ? Stonehenge dates back to being built around 3100 BC. This is in collaboration with creation of the Mayan calendar and the invention of the Sumerian language. 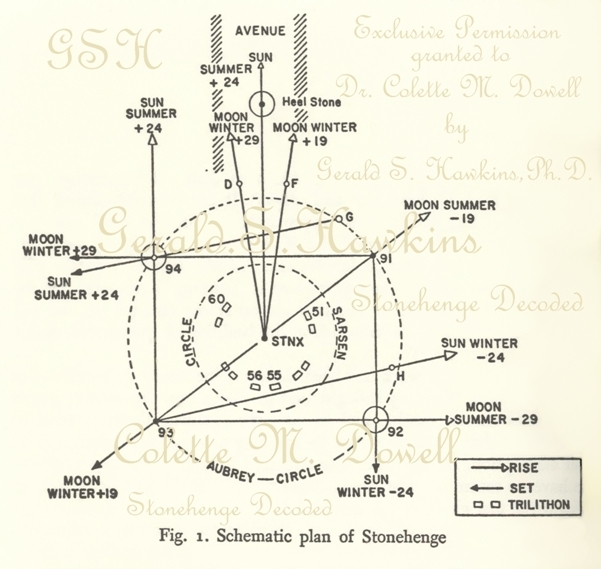 On analyzing the Stonehenge several historians have suggested the possibility of the Stonehenge giving clues to the end of time in the same way the Mayan calendar does; thus showing a link between the two. It was believed that the Stonehenge was used to tell time using the Sun’s solstice. With the rising and setting of the sun, one can observe time. During one day of summer the sun is set as far in the sky as possible. At this time the sun rises in direct alignment to a section of the Stonehenge known as the “heal stone”. This stone serves the same purpose as the hands of a clock as it casts a shadow over the Stonehenge sector. Coincidentally, this clock goes backward and acts as a countdown to the end of time – on December 21st 2012! On this day due to the wobble of the Earth on its axis and several other alignments, the heal stone will cease to cast a shadow indicating that time has run out. 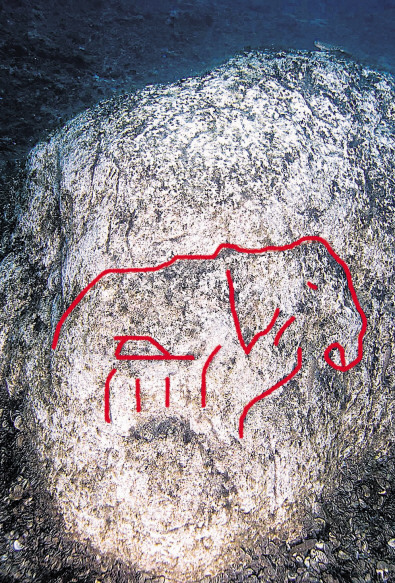 Moreover, archaeologists have found various carvings in the stone. Using carbon dating archaeologists some of these carvings include Sumerian numbers and writings. The numbers “33” and “32” is significantly engraved on the stones. Interestingly enough, with the Sumerian sexagesimal system, the number 33 is multiplied by 60 and then added to 32 giving 2012 ironically. 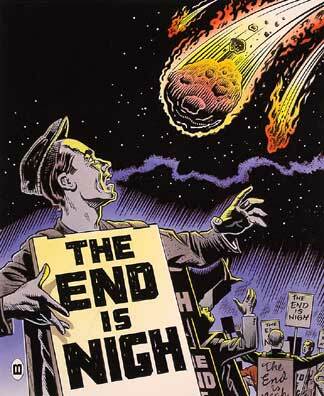 The writings of the Mayans and the Sumerians have suggested the world might come to end on December 21st 2012. Furthermore, the Mayan Long Count calendar ends on this particular date. These ancient civilizations lived in close proximity to each other; thus, had a lot of influence from each other to similarly predict the future. 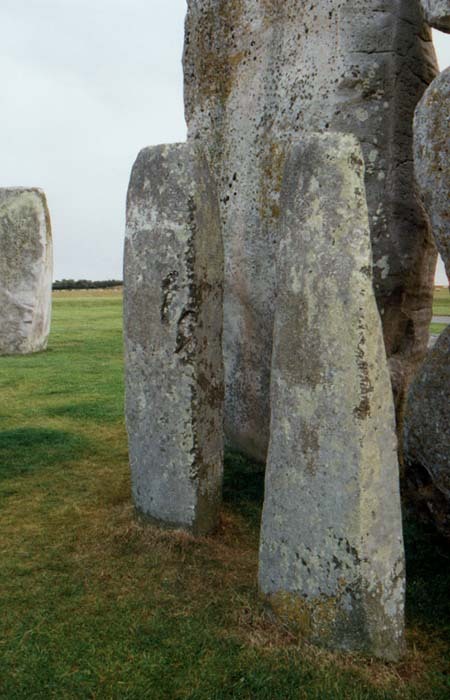 Yet, there are other objects that have marked the same date – Stonehenge! Could one of the “Seven Wonders of the World” really foretell the fate of our future? Stonehenge holds many secrets that mankind has yet to discover. It is possible that something will happen on December 21st 2012, as it is not only limited to one side of the world since the Mayans and Sumerians lived in Meso-America; 2012 is also a big part of history in other countries. As time passes, we might be able to discover more. Hopefully all this information should give us a better insight of what is to come. What will happen after December 21st 2012 ? hopefully December 22nd 2012 because I will be there trying to enjoy the sunrise and celebrations. 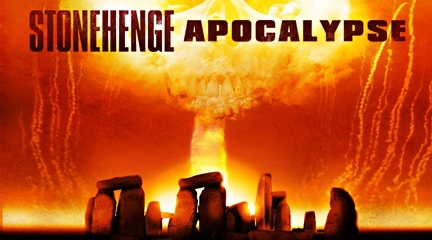 P.S My opinion – Stonehenge isn’t a doomsday clock! 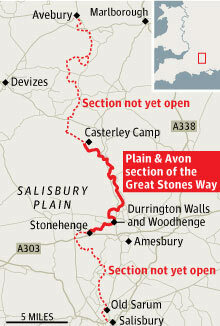 The Great Stones Way is one of those ideas so obvious it seems amazing that no one has thought of it before: a 38-mile walking trail to link England’s two greatest prehistoric sites, Avebury and Stonehenge, crossing a landscape covered with Neolithic monuments. But like any project involving the English countryside, it’s not as straightforward as it might seem. The steering group has had to secure permission from landowners and the MoD, who use much of Salisbury Plain for training. They hope to have the whole trail open within a year, but for now are trialling a 14-mile southern stretch, having secured agreement from the MoD and parish councils. The “Plain & Avon” section leads from the iron age hill fort of Casterley Camp on Salisbury Plain down the Avon valley to Stonehenge. Walkers are being encouraged to test the route, and detailed directions can be found on the Friends of the Ridgeway website. It’s an area all but the boldest have avoided: negotiating the MoD areas needed careful planning. Few walkers come here and not a single garage or shop along the Avon valley sells local maps. The Great Stones Way should change that. What makes the prospect of the Great Stones Way so exciting is the sense that for more than a millennium, between around 3000 and 2000BC, the area it crosses was the scene of frenzied Neolithic building activity, with henges, burial barrows and processional avenues criss-crossing the route. At Casterley Camp, high on Salisbury Plain, it takes me a while to realise what is strange about the landscape, as wild and empty as anywhere in southern England, and with a large burial mound directly ahead. Then it hits me: this is perfect high grazing country, but there’s not a single sheep. Maybe they have read the MoD notice which points out that “‘projectile’ means any shot or shell or other missile or any portion thereof”, and that over much of what you can see you’re liable to be hit by one. You can also be arrested without a warrant. But the trail cleverly and legally threads its way past the firing ranges towards a delightful and ancient droving road that plunges down between cow parsley to an old farm. One animal practising its duck-and-cover technique here is the remarkable great bustard, recently reintroduced to the UK after its local extinction two centuries ago. At 40lbs, the male bird is one of the largest flying animals in the world, so it’s unmistakable even for the most hesitant birdwatcher. As we reach an isolated farm building, we pass a Land Rover full of enthusiasts heading off to track some down. The trail curves below to cross and then follow the Avon, a river that loomed large in the affairs of Neolithic man. It was along the Avon that the bluestones of the Preseli hills in Wales are thought to have been transported by boat to Stonehenge, after being moved an almost unimaginable distance around both the Pembrokeshire and Cornish peninsulas to the river mouth at Christchurch. There are some pretty villages along the upper Avon: Enfold, with its flint and stone church, and old funeral wagon in the nave; Longstreet, with the Swan pub appearing at the right moment for a lunchtime reappraisal of the route; Coombe and Fittleton, with their judas trees, mill ponds and dovecotes. At Figheldean (pronounced “file-dean”), an allotment holder tells me he doesn’t grow courgettes “because they’re foreign food”. Woodhenge, Wiltshire. Photograph: AlamyIt’s a peaceful valley to stroll along, with some beautiful stretches under beech trees and past bluebell woods. Which is why it comes as a shock to have to stop for a couple of tanks to trundle past at Brigmerston ford. The route follows the tank tracks back across the river and out onto the plain, so the last stretch again has wide-open vistas of the prehistoric landscape. At Durrington Walls, the trail cuts through a huge enclosed area where the builders of Stonehenge may have lived – the site is aligned to face sunset on the summer solstice – and on past Woodhenge, with its concentric circles of wooden posts (marked now by concrete posts). As the walk gets into its finishing stride, you pass the King Barrows still sleeping along their ridge, some of the few sites that remain unexcavated (the local farmer didn’t want the trees cut down), and the mysterious Cursus group of Bronze Age barrows, so named because 18th-century antiquarian William Stukeley thought it must have been built by the Romans for chariot races. Across a meadow land of dandelions and buttercups, the familiar silhouette of the stone and lintel circle finally appears, at the end of the processional avenue that once led there from the river. In the distance, the stones themselves are a flat grey. What gleams all around them, like fish circling, is the traffic on the A303. I can’t help thinking how much better it is to arrive at Stonehenge on foot. The comparison that comes to mind, and which I know well, is the Inca Trail to Machu Picchu. The experience of trekking to both sites is immeasurably richer, not just because you’ve “earned it”, but because both sets of ruins are only properly understood in the context of the sacred landscape that surrounds them.